Premium speaker drivers with high-density neodymium magnets reproduce Hi-Res audio to 40,000 Hz, nearly double most headsets (22,000 Hz) and twice what the human ear can hear. From the gunmetal finish on the lightweight steel headband and aluminum alloy hangers, to the soft touch coating on the removable speaker plates, every surface is a sophisticated tactile experience. Next generation Headphone:X v2.0 immerses you in the action by delivering incredibly accurate positional cues. Lose yourself in the game as the audio comes to life all around you. Dial in your perfect mix of game and chat audio on the fly with no Alt-Tabbing, and connect digitally to your game with the ergonomic USB ChatMix dial. The self-adjusting ski goggle headband perfectly contours to your head while the athletics-inspired AirWeave ear cushions wrap your ears in cool, soft fabric, for hours of comfortable gaming. Choose from the full spectrum of 16.8 million colors. Plus, reactive illumination and custom lighting effects make your Arctis Pro a true reflection of your mood. SteelSeries Engine software allows you to customize the audio and performance of your Arctis Pro, from EQ and mic side tone, to RGB lighting to surround sound settings and more. 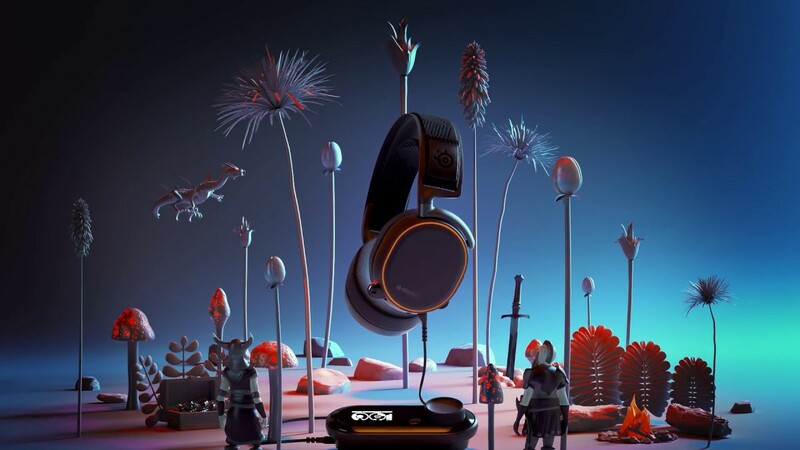 Arctis Pro was built from the ground up to deliver the best audio ever found in gaming. Esports athletes demand the highest quality sound, comfort and materials and Arctis Pro delivers.